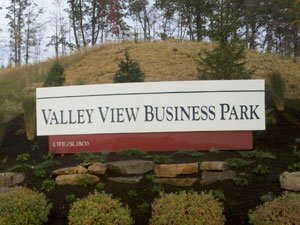 Valley View Business Park Professional Plaza is strategically located along the I-81 corridor, adjacent to US Route 6. The plaza is a sister development to Valley View Business Park and Jessup Small Business Center. Developed in 2017 by The Scranton Lackawanna Industrial Building Company (SLIBCO), the plaza consists of 20 acres and four building sites. SLIBCO is seeking retail and commercial development opportunities to service the adjacent parks. The proposed plaza development includes a hotel, restaurant, day care and convenience store/gas station. Sites within the Valley View Business Park Professional Plaza qualify for tax abatements under the Opportunity Zone Program, a component of the Federal Tax Cuts and Job Act. The park is served by UGI via an 8” plastic main rated at 60 psi. Each site has intermediate pressure with gas sleeves. Lackawanna River Basin Sewer Authority treats the effluent at their Throop treatment plant via a 2” low pressure forced main. PA American Water Company services the park via a 12” main. Available system pressure ranges are from 55 to 137 P.S.I.